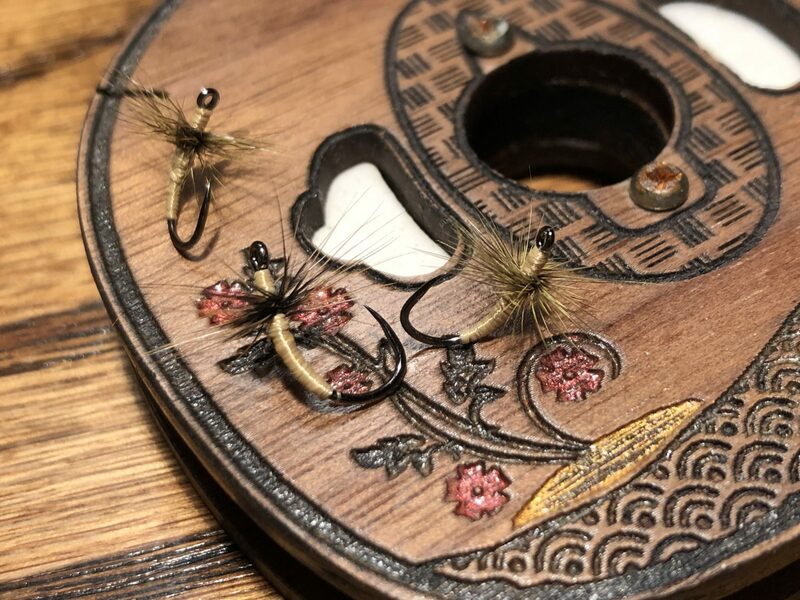 This is one of those “I already know someone’s thought of it (before I even say it)” ideas, but I had the thought last night to tie some simple stiff-hackle tenkara flies with Kevlar thread. 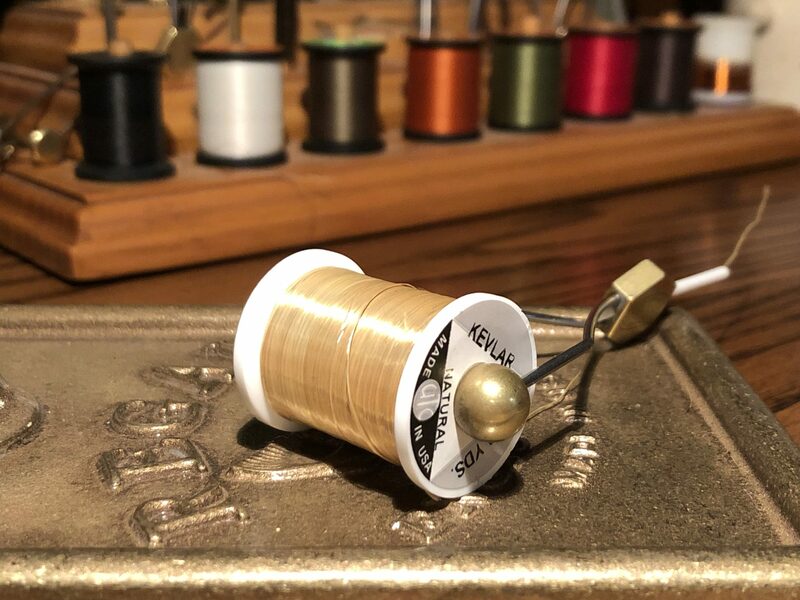 I don’t normally use Kevlar, but I had some left over from my days tying bass and saltwater flies and when I came across a spool of it in my drawer by happenstance, the distinct yellow color stuck in my mind. Kevlar’s natural color (if you can call it “natural”) is a pale yellow-ish. Not sulphur … not quite lt. cahill … but, well, just Kevlar. It’s difficult to dye and even the best processes can’t really produce a convincing red, black, or olive. For whatever reason, yellow seems to be an attractive color to trout, so “natural” Kevlar’s distinct take on it seemed to be a cogent choice. Plus, it’s got a slight, understated sheen that is “insecty” without being garish. Like some other materials (who shall remain nameless), I’m frenemies with Kevlar thread. For one thing, it’s slippery–unruly on the hook shank and can make it difficult to secure materials without proper placement and tension. And it’s “flat”, meaning that the individual fibers splay unless you’re diligent about twisting it into a tight rope before you wrap. To be diplomatic, I’ll just say it’s not the most user-friendly thread to work with and leave it at that. The name “bulletproof” is also a bit of a misnomer. While this fly is indeed made from the stuff of bulletproof vests, Kevlar thread isn’t as durable as one might think as a body material. It does have high tensile strength, but it’s made of many thin strands that are not very abrasion resistant. So you could probably suspend a 10 lb. downrigger ball with it, but you would make quick work of it with a few gentle scrapes of a nail file, reducing it to a scraggly pile of dubbing (…there might be another idea). So though it may not live up to its reputation in the durability department, it sure does look elegant. The above flies are just a few dress rehearsals and I’m sure I’ll be able to apply Kevlar thread to other designs. It’s just one more crossover material from my western fly-tying days that I’ve been able to translate into tenkara and will enjoy experimenting with, just as I have the others. Have you tried Kevlar for tenkara fly bodies? If so, please post your pics below in the comments section. I have some leftover kevlar, too, and I remember the year or so that Cortland/Climax was peddling it for tippets. Is the availability of leftover supplies enough to justify using them? Whether in flies or lines. I wonder how kevlar compares with other threads for persistence in the environment. When they degrade, do kevlar and/or other synthetic threads convert to innocuous chemicals or do they simply shred down to microplastic? Actually, not only do I think leftover materials justify their use, I think they almost demand them. They get you to start thinking outside the norm and to be more creative than adhering to conventional materials. On the point of environmental impact, given the millions of tons of plastic water bottles in our oceans, I hardly think a few wraps of Kevlar on some flies is cause for alarm. How long to you think that graphite rod you’re using takes to decompose and what does it break down into?